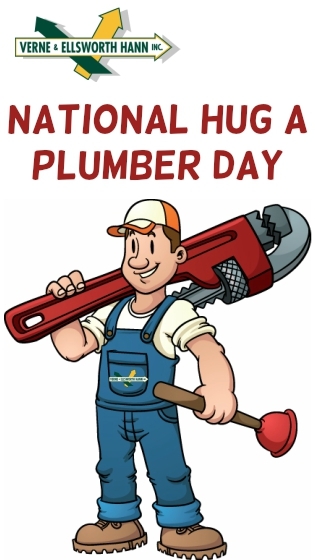 Today is April 25th…National Hug a Plumber Day! The last thing you want to come home to is a sudden plumbing emergency. Whether you live in Cleveland Heights, Shaker Heights, Lyndhurst, Lakewood or another area in Northeast Ohio, from a clogged toilet to a burst pipe, a plumbing problem can be a huge inconvenience. Even minor plumbing issues like a leaky faucet can lead to water damage. Verne & Ellsworth Hann can fix your plumbing problem, big or small! No matter what you need, Verne & Ellsworth Hann always delivers the highest quality work at an honest price. Our services include: Repairing or replacing broken toilets, hot water tanks, leaking faucets, showers, valves, pipes, garbage disposals, sump pumps and galvanized piping. Snaking drains, replacing cement laundry tubs, repairing gas leaks and much, much more! If you want the best plumbers in the Greater Cleveland area, look no further! With 5 generations of Hann family experience and servicing Cleveland Heights and the surrounding area for over 63 years, contact Verne & Ellsworth Hann today at 216-932-9755. On national hug a plumber day, we want to thank our plumbers for all their hard work and for keeping everything running!